São Paulo’s Rua da Consolação is often congested for hours each day, leading residents and city leaders to wonder if other transport modes such as bikes and mass transport can be used to cut down on traffic while increasing sustainable mobility. Photo by Carlos Barretta/Flickr. While the idea of ‘free time’ is by nature associated with individual choice and being momentarily ‘free’ from the demands of everyday life, the amount and quality of this time we have at our disposal is closely linked to city-wide forces. When traffic congestion increases, the amount and quality of city residents’ free time decreases. Congestion degrades the opportunity for people to build friendships across the city, decreases the energy people have for hobbies outside of work, and depletes the time people have to live, not commute. With rising car ownership rates contributing to increased traffic congestion in cities across the developing world, city leaders are taking steps to reverse this trend – both for the impacts on residents’ quality of life and the economic cost of sitting in traffic. The Brazilian cities of São Paulo and Belo Horizonte show how that it will take both citywide policy and changes at the individual level to turn the tide of car-centric mobility and move Brazil towards a future of sustainable mobility and high quality of life for urban residents. 40% of São Paulo residents own a motor vehicle. While this is lower than cities in the United States, it is still higher than most other Latin American cities and São Paulo’s infrastructure was not built to accommodate such a large number of private vehicles. Currently, the city is weighing two options. It can begin to create more highways, or widen existing roads, temporarily solving the congestion problem but quite literally paving the way to further increases in car ownership and congestion. Furthermore, as urban infrastructure typically lasts for decades, this pattern reinforces car culture and auto-centric development, making it harder for the city to build in sustainable transport options to its urban fabric. As The Urban Mobility Research Network of São Paulo found, some São Paulo residents spend one month per year in traffic, or 2.4 hours per day. As car ownership increases, and with it further congestion, this time spent in traffic will only grow. Prioritizing mass transport creates a way out of this dilemma. Creating dedicated bus lanes, which have the capacity to carry ten times more people on roadways than cars, is a strong first step, which the city is already pursuing with its 374 km (280 miles) of bus rapid transit (BRT) lanes. But top down leadership is not enough to complete the shift to sustainable mobility; public support and buy-in is vital to creating a truly sustainable city. While 93% of Brazilians consider using public transport such as walking and cycling, 47% still believe that owning a car is vital. Many are so used to long commute times – with 52 minutes in Curitiba considered “fast” – that they are content with the status quo. São Paulo’s Urban Mobility study reflects both recent progress and documents the enormity of the tasks still ahead. These challenges are also present in nearby Belo Horizonte, which recently inaugurated its MOVE BRT system, with two corridors already in operation. It integrates a network of four corridors whose length totals 23 km (18 miles), and has brought sustainable, affordable mobility to many neighborhoods and increases residents’ ability to access greater economic opportunities and services outside of their single community. 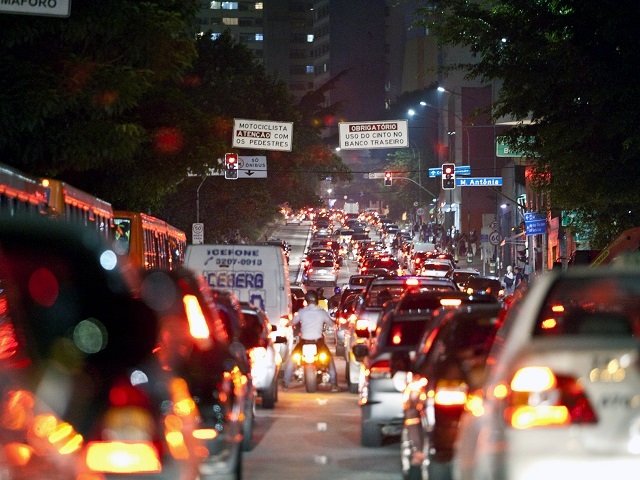 Despite this, Belo Horizonte commuters still lose one day per month in traffic. This trend is increasing, for within the past five years, 33% of respondents to the Urban Mobility survey say that they have changed their travel habits. Yet, of these, 67% migrated from public transport to private cars, while only 24% took the opposite approach. Brazil’s city leaders can begin implementing policies that promote transit-oriented development (TOD), which intensifies the development of housing, trade, and services around transport hubs. But there also needs to be a push from the Brazilian citizens to remember a time when travelling to and from work did not consume all of their free time. Together, sustainable transport decisions on a personal and on a policy level can help all of Brazil’s residents get back to enjoying the family dinners, the late-night parties, the yoga classes, the romantic dates, all that make life beautiful and rich … instead of simply trying to get to them. A version of this article was originally published in Portuguese on TheCityFix Brasil.